When my littlest Junior Tribe Member was a little tyke, he was plagued with frequent, raging ear infections. His temperature spiked high, his ears hurt bad and he was sick. We would come back from the doctor’s, prescription in hand. The antibiotics hadn’t yet kicked in yet, and I’d just barely given him Tyelenol. It was hard to watch him be in so much pain, so sick. It was then that he would tell me that the only thing he could think to do to handle how sick he felt was to play street hockey. Ridiculous, I thought…but it worked. His soaring fever, his flushed cheeks, his ear pain all faded into the back ground. The two of us would go outside, pull out the goalie net from the garage and have’at’er with the sticks and ball. The rough day disappeared with the joy of street hockey. Is there anything so Canadian as street hockey? 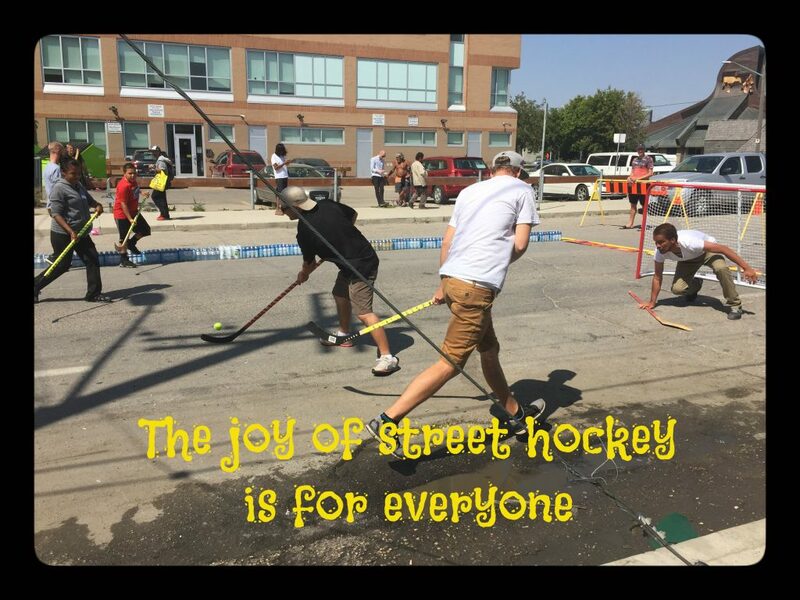 I had a front row seat yesterday on the street hockey game at Main Street Project…while I helped with the clothing distribution, I could watch the action. Carter Bergen, the staff person at Main Street Project, joined me on Hal Anderson’s Afternoon show this afternoon. Carter just happens to be one of my Junior Tribe Members! We had a bit of fun-yesterday, I went to his work. Today he came to mine! It’s hard to sign up for a team without an address. Being homeless takes so much time, there isn’t a lot of space to enjoy leisure. Today, the folks at Main Street Project had a blast. Kids played. Men played. Women played. Staff played. Together. Street hockey is the great unifying activity of our country. The smiles on the street hockey atheletes were captivating. People ringed the game, watching, talking, laughing and slurping down water in the heat–it felt like community. I spoke to D., one of the friendly volunteers…she helps out often, feeling like Main Street Project is rather like family. She is a current volunteer…and a former client. She loves this place…and she walked around checking in on folks, helping people get water, encouraging them to get what they needed at the hot dog stand, or get their hair cut. Folks were getting their nails done, and finding a new shirt. People were laughing and talking. It was magical. The troubles of life faded away…staying hydrated was the only challenge of the afternoon–well, and putting the ball in the net! Playing a game reminds people of who they are when they aren’t focused on the next meal, the next bed, the next drink, the next fix. Enjoying a game reminds any player of who they are when they just are. Without the worry. Without the pain. The natural and deep laughter than comes from working hard and putting the ball in the net, and the universal hands raised in the air when a goal is scored creates a natural high that made it fun for us all to watch. We all need to have fun and to get lost in the beauty of being on a team. When a person is focused only on passing the ball, the troubles of the day fade away. When one little kid scored, from the sidelines, a dad yelled with pride, “That’s my boy!”…a line every little boy wants to hear from his dad. It was beautiful. Ordinary. Street hockey has entertained children of all ages for the ages. It made my son feel better when he was feeling very lousy. And today, it gave a good feeling to those playing on Martha Street in front of Main Street Project.